Most ROV pilots are familiar with the vanishing target problem when operating mechanically scanning sonar. During the approach with an ROV or any other moving platform, heading alterations of major proportion will often place sought-after targets outside of the viewing sector of the sonar on successive sweeps. What follows frequently, in order to relocate the object, is a sector increase on the sonar, as well as platform stabilization via contact with the bottom, which is time-consuming. 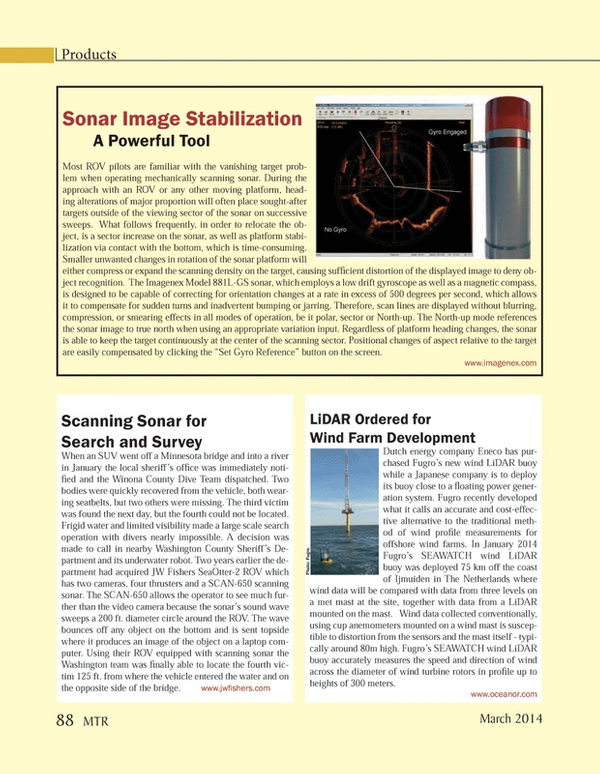 Smaller unwanted changes in rotation of the sonar platform will either compress or expand the scanning density on the target, causing sufficient distortion of the displayed image to deny object recognition. The Imagenex Model 881L-GS sonar, which employs a low drift gyroscope as well as a magnetic compass, is designed to be capable of correcting for orientation changes at a rate in excess of 500 degrees per second, which allows it to compensate for sudden turns and inadvertent bumping or jarring. Therefore, scan lines are displayed without blurring, compression, or smearing effects in all modes of operation, be it polar, sector or North-up. The North-up mode references the sonar image to true north when using an appropriate variation input. Regardless of platform heading changes, the sonar is able to keep the target continuously at the center of the scanning sector. Positional changes of aspect relative to the target are easily compensated by clicking the “Set Gyro Reference” button on the screen.